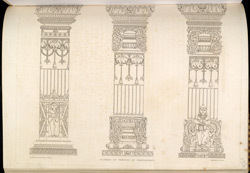 Etching of temple columns at Chandravati, by Edward Francis Finden (1791-1857) and Patrick Young Waugh (1788-1829). Plate 11 from James Tod's 'Annals and antiquities of Rajast'han or the Central and Western Rajpoot States of India' published in London in 1829. In 1818 several princely states of Northern India signed a treaty with the British and Colonel James Tod became the first Political Agent to the Western Rajput States. Along with his official duties, Tod became very interested in the genealogies of the Rajput Kingdoms as well as the art they produced. Chandravati is a small abandoned site near Jhalarapatan in Rajasthan. Ruined temples similar to the one found here were constructed in the same style as early as the 7th century. Many sculptures formerly at this site were moved to Jhalarapatan at a later date. The three columns in this etching are elaborately decorated with foliate motifs while figures of maidens decorate the bases.